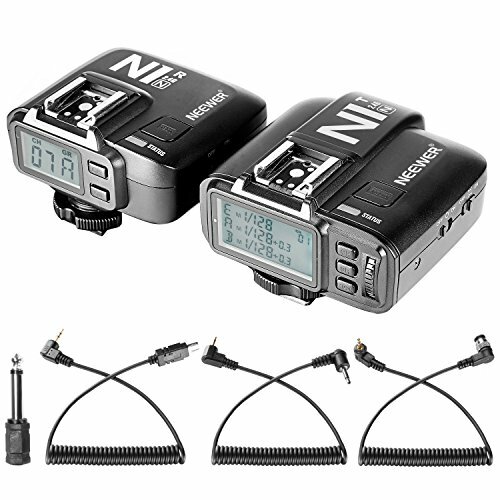 With 2.4G wireless transmission and 100m workable distance, N1T-N can function as a remote studio trigger, a camera flash trigger and a camera shutter release. Support for functions included i-TTL autoflash, manual flash, high-speed sync, flash exposure compensation, flash exposure lock, manual focus,modeling flash etc. Wireless grouping system and 32 channels to have multiple flashes under control simultaneously. With large and clear LCD panel to offer great convenience. Comes with 1 * Transmitter+1 * Receiver. Note:Camera and battery are not included.